We are excited to announce the release of a new feature: weekly charts. 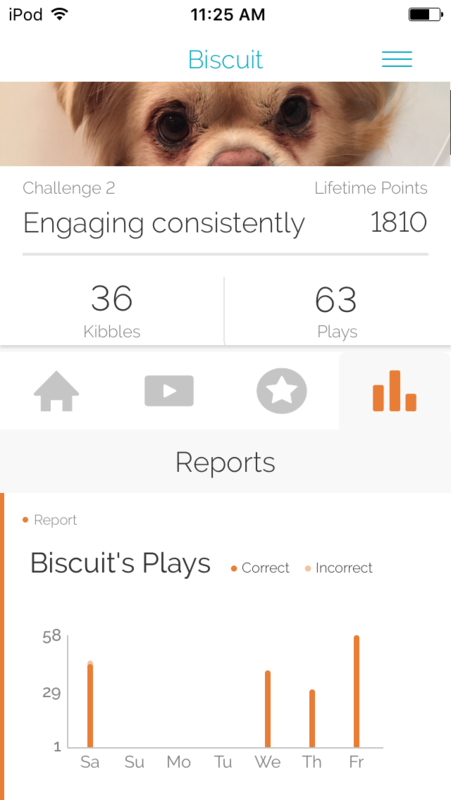 Every week, our app will present a summary of your dog’s activity and give you more insight into how your dog plays with the Hub. Charts will be generated on Saturdays, showing how many times your dog played with the Hub over the week and the fraction of plays he won each day. This is a report for Biscuit, a 6 year old Tibetan Spaniel. 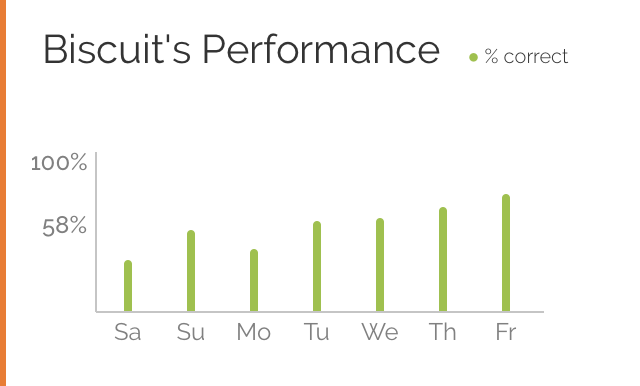 After his first week, Biscuit played on four out of seven days. The total number of plays per day (same as “plays” on the homepage of the app) is indicated by the total height of the bar. The bar is coded in two colors: a light orange for incorrect plays and a dark orange for correct plays. 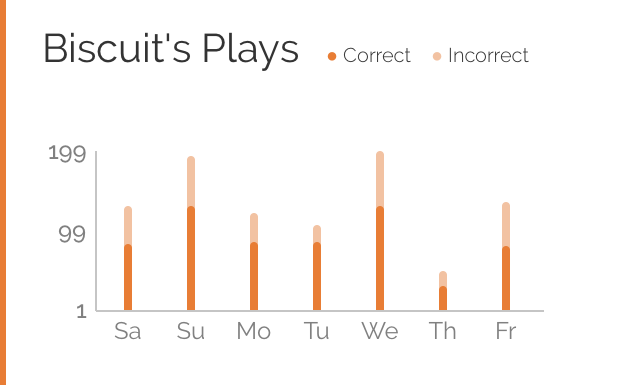 For Biscuit, almost all plays are correct and the bar is dark orange. Because the beginning challenges are very easy and eating food is considered a “correct” play, this is typical of initial play on the Hub. Three weeks later, we can see that Biscuit plays 2-3 times more than he did in the first week. Each challenge defines what counts as “correct”. Three weeks in, Biscuit is learning to avoid pressing the unlit pad. Since only two of the three touchpads count as a correct response, he will be correct 2 out of 3 times (66%) if he’s taking random guesses. Like many dogs at this point, Biscuit learned a strategy to get more food – but still doesn’t understand the relationship between his actions and the lights. At the end of the week, Biscuit is still guessing and still at 66%! That’s perfectly normal. Some dogs take a while at this point, but they’re still engaged and acquiring information – even if it doesn’t look like they’re learning yet. Biscuit has learned that the Hub is a reliable source of food and there’s the opportunity to engage daily. Biscuit is also learning that he’s in control; simple actions lead to rewards. This experience of guessing – hearing the “Whomp!” of an error or the “Pling!” of the correct press – provides the scaffolding to learn the rules of the challenge. At the beginning of the week, his performance is at 33% (consistent with random guessing when only 1 of the 3 pads is available). Looking at Sunday alone is not very convincing; it could just be fluctuations from limited data on one day, especially since Biscuit’s performance dips the next day. But from Tuesday to Friday, his performance increases to 70% correct. Biscuit is learning! You may wonder, “How good is good enough to advance?” The criteria vary from challenge to challenge. For example, how often the dog is playing is a main criterion for advancing in the “Engaging Consistently” challenge. The more advanced challenges tend to focus on pressing the correct touchpad or sequence of touchpads. Since challenges assess performance continuously, the average performance within a day won’t always line up with the metric that determines advancement. Nonetheless, for many of our challenges, being consistently over 80% correct is a good indicator that the dog will advance soon. Is there any way to get more frequent updates about my dog's activity? Yes! Find more information about live charts here.